First a story: I made some failed chocolate-covered sea salt caramels (read the candy thermometer wrong, and made hard candy), that I now sheepishly serve as chocolate-covered toffee...salty toffee...something like Skor bars, I say. 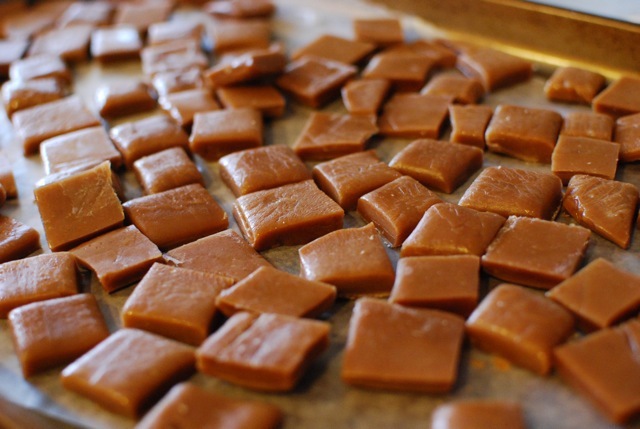 When a certain occasion a few weeks ago demanded that I make a salted caramel cheesecake, I resourcefully turned to my hard-as-rock caramels toffee for a crunchy topping. 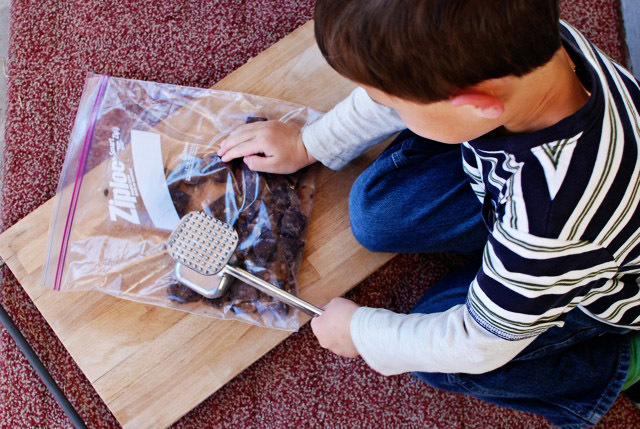 Instead of turning to my food processor as I would normally, I handed the failed chocolates in a plastic Ziploc bag, along with a mallet, to my four year old. What ensued was one of the most efficient and well-loved exertions of preschool energy upon hard candy. That boy loves to whack and pulverize. This was no less than a dream come true...and I got a bag of toffee bits just like I wanted. Do you find yourself overlooking potentially fun or educational tasks for your kids at times because you are too enamored with efficiency and getting it done "the right way?" Do you, too, find yourself saying, "I'll just do it myself to save time and mess!" Surely there is a time for training and a time for efficiency; a time for fun, and a time for getting it done. Not every task is suitable or realistic as a learning experience. However, I'd bet most of us err on the side of passing up opportunities, rather than taking advantage of them. It's taken me 8 yrs. to fully realize that kids learn by doing...and kids can't learn to do for themselves without making messes and making mistakes. So, as we look to getting beds made, laundry done, meals cooked, and toys put away this day, let us not forget to let them try. We may at times find the task elongated, the residual mess more tedious, or the outcome imperfect, but we will never find the time wasted. At least, not for the reason we've been given the time in the first place.